While scientific studies have already shown the clear link between fracking and earthquake activity, courts have been less enthusiastic in making the connection. That, however, may be changing. Over the past several years a number of lawsuits have been filed alleging fracking activities have caused earthquakes and now the Oklahoma Supreme Court is taking up the issue. Case Watch is a piece that will highlight ongoing legal battles over land use, environmental, and development issues in Georgia and throughout the country. This is a significant issue in the state given that Oklahoma recorded 567 earthquakes of magnitude 3.0 or higher in 2014. While that number may hardly be shocking for states like Alaska or California, the opposite is true for Oklahoma: those 567 earthquakes are more than the state recorded in the previous 30 years combined. The state is currently on pace for over 850 earthquakes this year and recently surpassed California has the most earthquake-prone state. Is it just a coincidence that the spike in earthquakes has coincided with the presence and intensification of fracking activity or is there a direct causal link? If there is a causal link, should oil and gas companies be liable for such earthquakes? This is the task at hand for the Oklahoma Supreme Court. Fracking is the process of injecting fluid into the ground at high pressures in order to fracture shale rocks and release natural gas. While the process is effective in obtaining natural gas, studies have shown that fracking can cause a host of environmental problems including seismic activity and water contamination. New technology has allowed oil companies to drill horizontally underground to reach previously inaccessible natural gas. The process, however, results in as much as ten barrels of toxic, briny water for every barrel of oil. This resulting water is pumped back underground into storage facilities, which is what has been linked to seismic activity. The suit is based on a 5.7 earthquake that hit Prague, OK back in 2011. This was the largest earthquake in state history and was followed by several aftershocks, each with magnitudes above 4.5. The earthquakes resulted in damage to nearby homes and roadways and were felt by residents for hundreds of miles. In the complaint, Plaintiff Sandra Ladra alleges that New Dominion, LLC and Spess Oil Company were negligent in operating their injection wells in such a way as to cause seismic activity. As part of a negligent allegation, a plaintiff must show that the defendant had a duty to the plaintiff, failed to use the requisite standard of care, was the actual and and proximate cause of the damage, and that damage actually occurred. Ms. Ladra is also alleging absolute liability under the theory that fracking is an inherently dangerous activity. In many states, such activities come with absolute liability, meaning even if you take necessary precautions you are still liable for any resulting damage. The key question really is in the element of causation. The US Geological Survey and other scientists have concluded in a several studies that generally fracking activity can directly cause seismic activity. 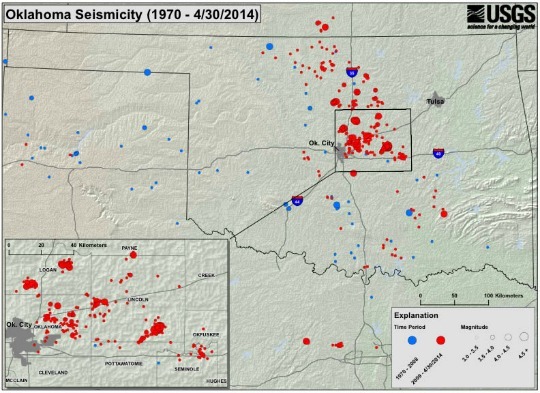 In investigating the Prague, OK earthquake, the USGS went beyond showing a general causal link between fracking and earthquakes and made the direct connection between that particular earthquake and nearby fracking activity. Meanwhile, the Oklahoma Geological Survey (OGS) has concluded that fracking can trigger earthqakes, but has stopped short of drawing a connection between particular earthquakes and fracking activity. Recent OGS emails, obtained through Freedom of Information Act requests, show oil companies pressuring OGS officials to take a slow approach in finding a causal link between fracking and seismic activity. Ultimately, the Oklahoma Supreme Court will decide whether a state court is the proper venue for such a claim. The District Court of Lincoln County dismissed the complaint based on lack of jurisdiction, concluding that the proper venue for such a claim is with the Oklahoma Corporation Commission. The fact that the Oklahoma Supreme Court took the appeal directly from the District Court of Lincoln County shows the urgency of the issue. The Court’s decision could open the door for oil companies to be found liable in state courts. Fracking hasn’t yet reached Georgia, but oil companies are eyeing the northwestern part of the state for such operations. An Oklahoma-based company has already purchased land near Dalton to explore the extraction of what is believed to be trillions of cubic feet of natural gas in that part of the state. Such activity will certainly produce jobs, but at what cost? Perhaps we will see an uptick in the number of local ordinances aimed at regulating or preventing fracking operations in the near future. This will usher in a whole new set of arguments over state vs. local control over land. It could also factor into the debate over how water is used as part of the Tri-State Water Wars. Fracking uses a tremendous amount of water, water that southern Georgia farmers, Florida fishermen, and Atlanta-area residents would probably like for themselves. Should the Oklahoma Supreme Court decide that oil companies can be held liable in state court it could discourage the proliferation of fracking activities throughout the country or could encourage oil companies to research better ways to prevent earthquakes and contamination.